Running your own business can be overwhelming. There is so much to do and, as a solopreneur, every task requires your attention. The key to success is to spend your time where it really matters. That means staying out of the time traps that drain your energy, reduce your productivity, and have little impact on your bottom line. 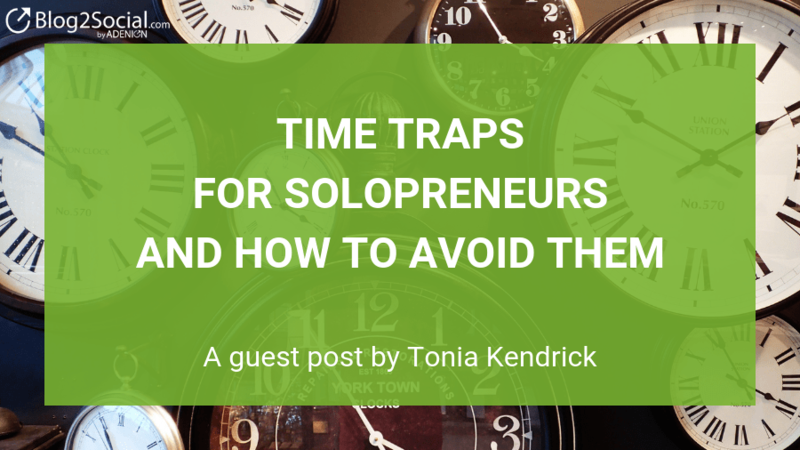 Here are seven time traps that solopreneurs often face, with solutions to help you avoid them. One of the most common – and detrimental – time traps faced by solopreneurs is lack of planning. When it seems like you have a million things to do every single day, it’s easy to fall into the trap of diving into work. But if you do this, chances are that you won’t be working on your highest priorities. You’ll be much more productive if you carve out some time for planning. Once a quarter, choose three or four strategic goals that you will focus on for that 90-day period. Make sure your quarterly goals are SMART (specific, measurable, actionable, relevant, and time-bound) and that they tie into your long-term strategic goals. Then take each one of those quarterly goals and break it down into five to 10 action items. Resist the urge to add more goals and more action items. The key to success is to ruthlessly cull out low-return activities. You should only spend your time on tasks that will help you achieve your long-term goals. Pro-tip: Be sure to include marketing and social media in your quarterly plan. A good rule of thumb is to put as much effort into marketing your business as you put into product or service development. If you are currently jumping around from task to task – five minutes answering an email, 10 minutes working on your marketing plan, 2 minutes on email, over and over again – you are wasting a lot of time getting back on track when you switch from one task to another. A study done at the University of California, Irvine shows that it takes about 23 minutes to get back on track when you switch tasks. So that five minutes that you thought you spent answering an email actually used almost 30 minutes of your productive time. Time blocking is the antidote to task switching. If you aren’t familiar with time blocking, it simply means that you set aside a certain amount of time to spend on specific tasks. When you assign a task or project to a time block, then you free yourself up to focus on that task and that task only. So, instead of spending five minutes here and there throughout the day answering email, you could set up a 30-minute block in the morning and another in the afternoon to blow through your inbox. You can also set aside larger blocks of time to work on those high-value action items from your quarterly plan. When you do so, you make sure that your most important work actually gets done. To implement time blocking, you can create appointments in your calendar app or use a simple time-blocking template to schedule your week. We all know that administrative work is necessary. Administrative work includes everything from answering emails to scheduling appointments to keeping the books. It’s all necessary to keep the business running, but none of it generates revenue. The best strategy is to move these tasks onto somebody else’s plate, like a virtual assistant. However, if that isn’t feasible, then you can implement strategies to get them done faster. Keep a time log – The first step is to find out how much time you really spend on administrative tasks. You can record your time on paper or with an app like Toggl or Timely. Tracking your time will help you identify tasks that can be cut or streamlined with templates and workflows. Create templates – Doing the same work over and over is a huge time trap. Templates cut down on repeated work by giving you a starting place that can be customized for the individual situation. Consider creating templates for emails that you write often, blog posts, social media graphics, etc. Document workflows – Any task you perform regularly should have a documented workflow. You waste a lot of time by thinking about what you have to do to complete a task. If you create a simple checklist that includes all the steps in the process, then the next time you perform this task, you can get right to work. Using the right tools – Many tasks can be performed faster with the aid of the right tools. Think about the tasks that regularly take up your time. Maybe you are spending too much time sharing your content on social media. Or scheduling meetings (see below). Or managing client information. With a bit of research, you can find a tool that can reduce the time you spend on basic tasks. Perfectionism is often procrastination in disguise. Focusing too much on creating something perfect keeps you from actually finishing anything. Open-ended projects give you more time to fuss over details. Try establishing firm deadlines for every project or task. Without boundaries, you will quickly find yourself working constantly, with very little free time. This is a recipe for stress and burnout and probably isn’t what you had in mind when you started your solopreneur business. and then sticking to them. Flex time is great and may even be one of the reasons you went into business for yourself. But flex time can get fuzzy, especially if you work from home. Decide when you will start and end your day, knowing that you can make adjustments on an as-needed basis. How can people get in touch with you? Email, messaging, cell phone? What hours are acceptable? What about weekends? What is your normal response time? You have to respect these boundaries as well. If you reply to an email on a Saturday night, then you’ve set a precedent and the person you responded to will expect you to continue. Decide on the days and times that you are available for meetings. Maybe you want to have all your meetings on the same day. Or you only want to meet during the hours when your kids are at school. Then, instead of scheduling meetings on the fly, use a scheduling tool that integrates with your calendar. A scheduling tool helps you avoid wasting a lot of time going back and forth about “what time works best for you.” You can simply send the other party a link to book an appointment with you. You Can Book Me and Calendly are two options for scheduling tools. Both allow you to block off times that you are unavailable for meetings. And since they sync with your calendar (Google, iCloud, etc), they automatically block off times that you are already booked. Distractions might include loud conversations, ringing phones, email alerts, and the ubiquitous social media channels that want to drag you away from work. Rather than allowing them to constantly interrupt you, find a way to put a stop to them or at least minimize the effect they have on your focus. If noise is a problem, then close your office door or try noise-canceling headphones to block out the sound. Listening to music or ambient sound may also work. And, of course, turn off notifications on your computer and phone. Instead, set up specific times during the day that you will check messages. Finding ways to get everything done while running a thriving business is a challenge that most solopreneurs face. In this post, we’ve offered solutions to seven common traps that solopreneurs often fall into. But what if you find yourself stuck in other time traps? Time is one of your most valuable assets, so you need to view it as something to preserve and protect. When you find yourself stuck in a time trap, approach it as a problem that can be solved. Reflect on the problem. Brainstorm solutions. Then create and execute a plan to avoid that time trap going forward.